Are you an out of work little person? do you want to make some serious cash in one evening? 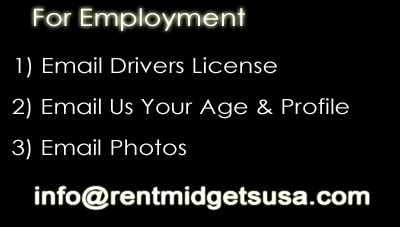 you can start right here by calling, emailing, or texting our san diego location your profile, .pictures, and resume if you have one to offer but please do not be intimidated to apply with Hire Midgets.com as we are always looking for new talent no matter if they have experience or no experience.So if you like the color of money and enjoy being social with fun and friendly party people that contact us asap! We are looking for new midget entertainers near cities below. san marcos - temecula - san clemente - oceanside - fallbrook - valley center - la mesa - la jolla - chula vista - pacific beach - el cajon - mira mesa - rancho sante fe - vista - pala mesa - escondico - national city - la presa - all california.